All users of the HealthCloudPOL must be defined here. They are given a login ID and password, and other details are set up, including password expiration, access profile (Lab Manager, MTA or Office Staff) and more. Navigate to the User Management screen in the Administration folder. 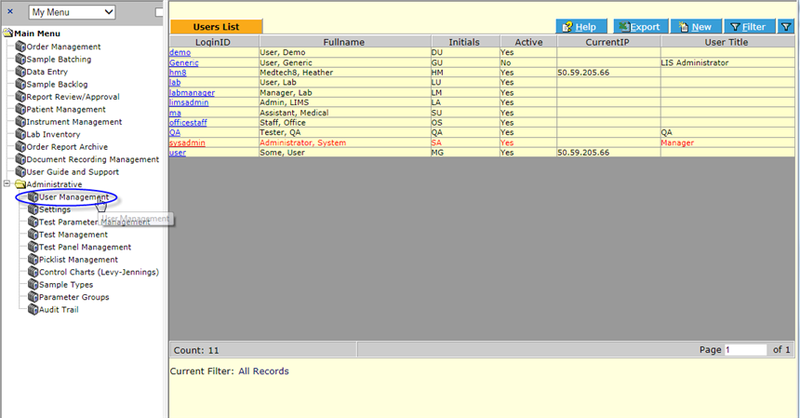 All existing users in the system are displayed in the main list screen. 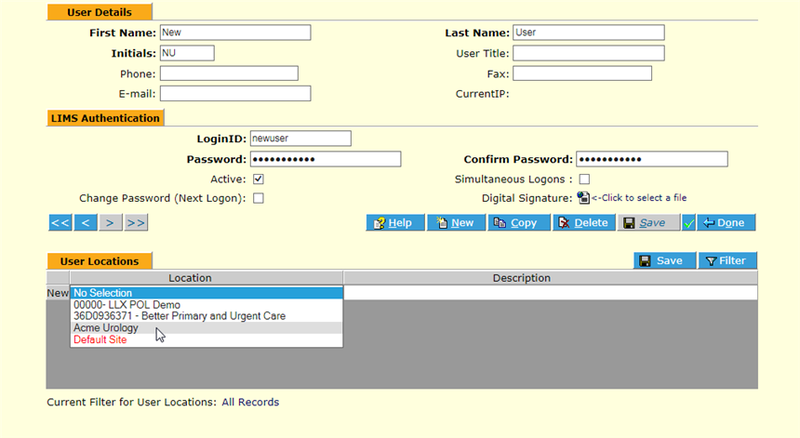 To view user details, click the LoginID hyperlink. Any users currently logged in show an IP address in the CurrentIP column. The User Detail screen is displayed. NOTE: If you need to log off a user, it can be done by clicking the Clear button. The easiest way to create new users is to simply Copy an existing user and then make necessary changes. To do that, go to an existing user’s User Detail screen and click the Copy button. The screen will remain populated with the copied user’s information, but a popup dialog will instruct you to make the appropriate changes for the new user. In either the User Management list screen or the User Detail screen, select New . The User Detail editable screen displays. Here you can enter appropriate information. Bold fields are required. Passwords: Passwords must have at least 6 characters. Additional constraints or attributes are set using the User Configuration frame in the User Management section (visible after having saved initial New User definition, exiting and returning). Active: To activate the user in the system, the Active checkbox must be checked. Simultaneous Logons: After defining the user, saving and exiting the screen, you can return and check this box then save to allow multiple open screens at the same time for the user. Change Password (Next Logon): If checked, this will generate a popup dialog for the user the first time he/she logs in, requiring that they create a new password at that point. This is helpful in maintaining security, so that even the LIS Administrator does not know the password for users (although the administrator can of course change/reset them at any time through User Management). Digital Signature: You can designate a digital signature for that user to be used on reports, etc., by either scanning a signature or selecting a unique (and secure) image, and uploading it here. Once all required/desired information has been entered for the user, click Save . The User Locations frame now displays on the User Detail screen. Select your location, then to the right of it select the correct user access profile for that user. This is a required field, even though its label is not in bold. Important Note: If an inactive location is selected, the user will not be able to access HealthCloudPOL. Click the Save button on the User Locations frame. Click Done . The new user displays in the User List. User setup is not complete until this step is performed. 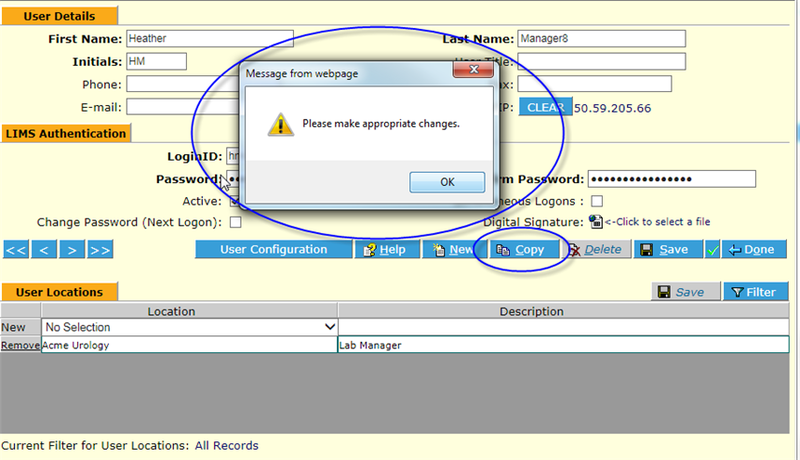 Once the user has been initially defined as described above, click Done to exit to the User Management List screen. 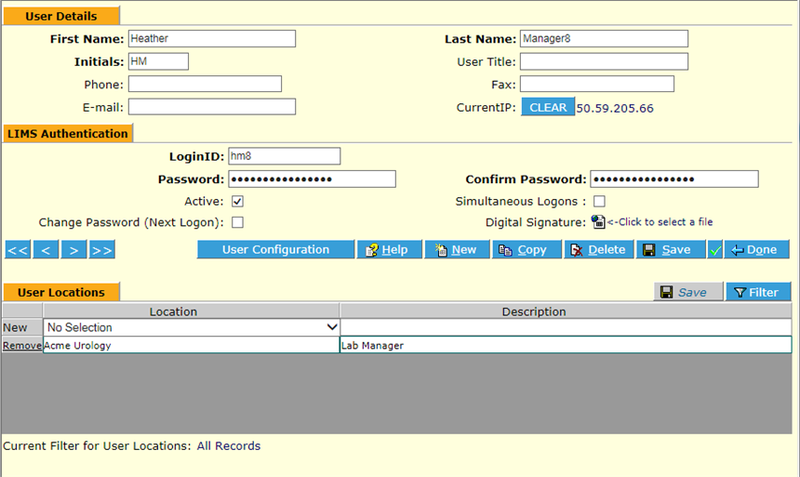 To finish user setup and further define password usage, click on the user LoginID. In the User Detail screen, click the User Configuration button. The User Configuration screen displays. Here you can set additional parameters regarding the user’s password, as well as the number of minutes of inactivity allowed before auto-logout, number of days before password expiration, how many passwords the system will count so that they are not repeated, the number of times the user may enter incorrect passwords before the system locks them out and directs them to consult the administrator, and warning message on/off. Selecting Use Default overrides any choices and sets LabLynx default values. Warning messages or indeed any messages of various types can be set up here, for a predefined, standard event or upon login. Select event type from the drop-down picklist. Enter any text that should be displayed to the user upon login or the selected event. Make sure the Warning On box is checked and click Save and Done . To delete the message, click Delete (this will not delete the user or user information on the previous screen). To make any changes to a user or their configured properties, access the appropriate screen using the method described in To View Users above and make desired changes. Remember to click Save and Done . To delete a user, select the user, then click the Delete button.